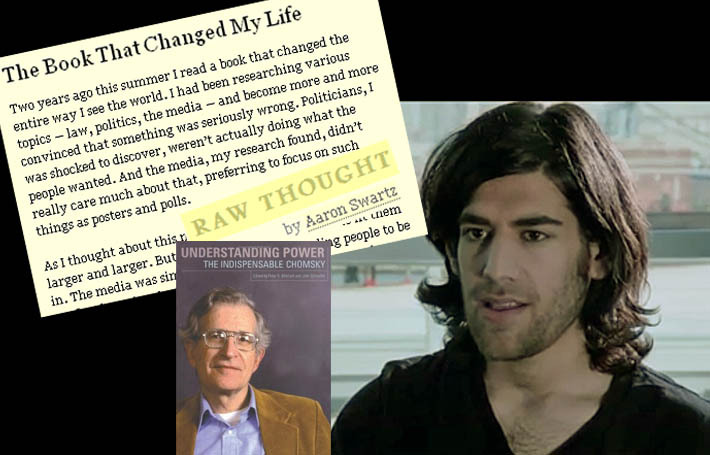 So You Are Looking To Make Sense of The World And Want To Get That Same Book From The Library “To Change Your Life” That Aaron Swartz Did? Expect The Sweet Smell Of Success To Elude You. Aaron Swartz said a book from the library changed his life- Picture of Aaron Swartz from an interview shortly before his suicide- "Three young New York filmmakers sought to document how the internet is largely controlled by profit-seeking corporations, even as it has evolved into the world’s gateway for speech." Aaron Swartz lived in Brooklyn. The Brooklyn Public Library has zero copies of this book throughout its sixty library system. That is zero copies of the thick paperback, zero copies of the much harder to obtain hardcover, and zero copes of any digital edition (or audio edition) of the book. Some very important books, including about books about "power," such as Robert Caro’s “The Power Broker: Robert Moses and the Fall of New York” are simply not available digitally, but if the Brooklyn Public Library wanted, Noam Chomsky’s “Understanding Power” is available digitally, albeit digital books have a disadvantage for libraries of being more expensive than physical books (libraries are charged more), plus libraries like the BPL frequently just lease their digital books, making endeavors to frame the public discourse like this one frighteningly ephemeral. Aaron Swartz was an activist and a major force in the open internet movement, believing fervently in the availability and free flow of information. While, a focus on the internet was central to what involved him in many of his passions, he saw libraries and librarians as contributing integrally to the ready availability of information and, for example, his “Open Library” project had the goal of letting people find their way to any existing book, including making those books already in the public domain more easily and freely available. 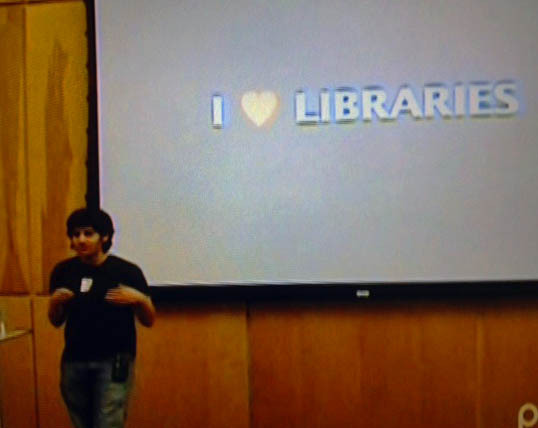 "I love libraries. You know, I'm the kind of person who goes to a new city and immediately seeks out the library": Aaron Swartz speaking, above, explains in the documentary, “The Internet's Own Boy: The Story of Aaron Swartz.” He goes on to say: "You know Books are the place people go to write things down. And to have all that swallowed up by one corporation is kind of scary." 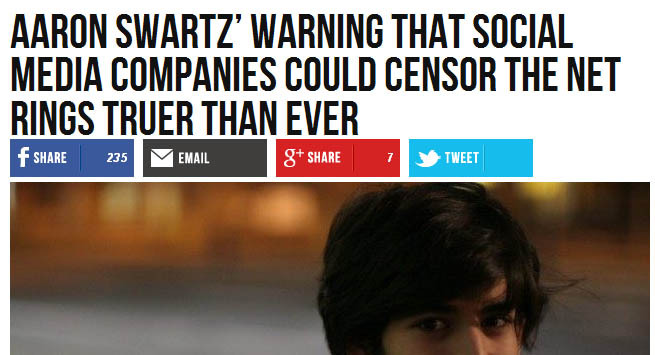 The censorship Swartz warned of might come from the government or from private corporations. It might also come from a conjoining of the two as manifested by SOPA, The “Stop Online Piracy Act,” that Swartz helped lead an uprising to defeat. By those envisioned changes to law the government would have conferred significant control over the internet and censorship ability to private companies. 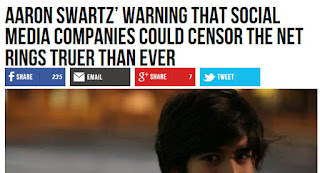 As Swartz noted, censorship by private companies can be worse than government censorship because the traditional constitutional protections are not in place. Are private companies going to censor [the] websites I visit, or charge more to visit certain websites? Is the government going to force us to not visit certain websites? And when I visit these websites, are they going to constrain what I can say, to only let me say certain types of things, or steer me to certain types of pages? Will speech be constrained? Will the public be steered to certain content? These concerns about the free flow of information don’t apply just to the internet.
. . . after reading that book, something seems to have switched [for Swartz] and he seems to have realized now that I've seen this, I can't unsee it. Now that I've seen how power works and accumulates, I can't pretend that I don't know how the world works. Swartz’s misdeed, technically a crime the way our laws have been written, was to download 4.8 million academic journal articles from a database (JSTOR) that, based on his previously published Guerrilla Open Access Manifesto he probably had thoughts of ultimately making more freely available to the public. A number of years before, no charges were pressed against Swartz when he downloaded and made more freely available to the public 2.7 million federal court documents from a federal database, documents which were technically already public, although not actually very easy to obtain from the Federal PACER (Public Access to Court Electronic Records) database the government managed. 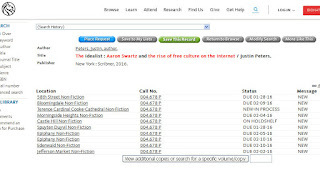 Prosecuted for downloading the JSTOR articles Swartz was faced with potential 90 years in prison . .
. . . The government very obviously placed an extremely high priority on protecting private copyright ownership interests and making an example of Swartz. In doing so they were also making an example of the man who had prevented a very scary expansion of those same private rights when he helped in defeating the proposed SOPA and PIPA (Protect Intellectual Property Act). The proposed SOPA and PIPA laws were defeated in the beginning of 2012. Swartz downloaded the public court documents in 2008 and was apparently followed by the FBI after that. These struggles, unfortunately, continue still and legal provisions highly reminiscent of the dreaded defeated SOPA and PIPA provisions stand to be enacted via treaty if the proposed 6,000 page TPP (Trans-Pacific Partnership) agreement is passed. Each story, individually, can be dismissed as some weird oddity, like what I'd learned about the media . . . . But seeing them all together, you can't help but begin to tease out the larger picture, to ask yourself what's behind all these disparate things, and what that means for the way we see the world. Here is one more weird oddity to add to the mix to see the “larger picture”: While the Brooklyn Public Library has no copy of the Chomsky book it has seven copies of a book it has promoted by one of its own trustees: “Success Never Smelled So Sweet: How I Followed My Nose and Found My Passion,” by Lisa Price. 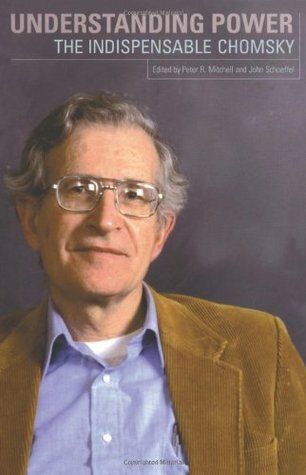 It’s a book that came out in 2004, the same year Swartz discovered Chomsky’s book, that self-promotionally tells of Ms. Price’s success in starting a beauty products company. In theory, it could be inspiring to minorities about perusing an entrepreneurial path although Ms. Price has had her ups and downs. It is perhaps fittingly symbolic that while all seven copies of Ms. Price's book sit unclaimed and unread by library patrons on Brooklyn Public Library shelves the one copy of Mr. Chomsky’s “Understanding Power” that is available from the New York Public Library, BPL’s sister library system, has seven people in line to read it. 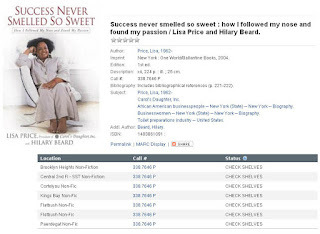 The NYPL, more frugally has just one copy of of Ms. Price’s “Success Never Smelled So Sweet”- that one can’t be claimed by borrower since it’s a research copy. One wonders if Aaron Swartz were alive today what he would have to say about the selling and shrinking of libraries propelled mostly by those interested in transforming them into real estate deals that benefit developers, not the public. 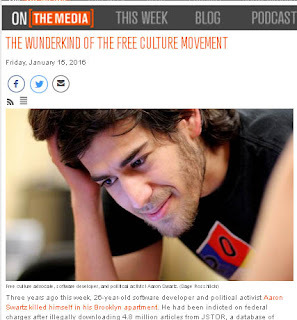 The issue was just gaining significant attention (partly with the assistance of Noticing New York*) as much critical new information surfaced starting in 2013, just when Aaron Swartz was unfortunately no longer with us. 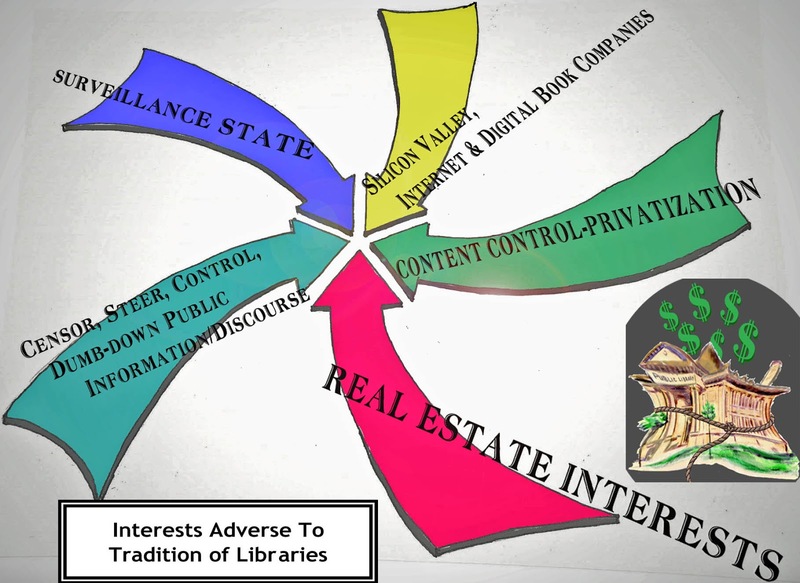 Would Mr. Swartz’s astute instincts also be picking up on the fact that a number of interests converging to besiege libraries are associated with privatizing content and `steering' the public to corporate products in the ways that Mr. Swartz pointed out as worrisome. Look at the chart below depicting some of those interests. Then consider, when you review, whether the trustees of Brooklyn Public Library should be those in charge of its mission and charting its course for the future. Above From: Why Nonprofit Boards May Stray From Their Core Missions And Obligations To the Public. Real Estate Interests - Content Control - Internet - Surveillance - Censor and dumb-down the public. To consider further whether we can rely on private sector trustees such as this to faithfully pursue public missions effectively and in a true spirit of charity, read the following where that chart was originally published: Why Nonprofit Boards May Stray From Their Core Missions And Obligations To the Public- Considered Generally And Particularly With Respect To Libraries. Books disappearing from the libraries? Empty shelves (obviously no copies of "Understanding Power") at SIBL and the Mid-Manhattan Library recently targeted for sale, and books being shipped out of the Donnell Library that was suddenly and secretively sold. One of the things well-known about Aaron Swartz is that, although he was not spending the money with personal ostentation and spoke instead of directing it into good works, Swartz made a dot-com fortune from the sale of Reddit, a content aggregation and discussion website, benefitting from having become an equity partner in the company through the merger of start-ups with which he was involved. Oct. 31, 2006 Reddit was sold to Condé Nast. Condé Nast is in turn part of a much larger conglomerate of companies owned by the Newhouse family and their Advance Publications, Inc., a conglomerate increasingly focused on digital platforms. Following the Reddit acquisition, Swartz went to work for a while for Wired, owned by Condé Nast, but soon departed since he didn't fit in. Reddit, along with some of the other social media platforms, all variously privately owned, are now embroiled in difficult censorship controversies. Where this will lead is unclear, but with increasing monopolization in the content industry the world becomes very small indeed- One of the trustees of the Brooklyn Public Library, Cindi Leive, editor in chief of Glamour, works for Condé Nast and David Remnick, editor of The New Yorker, another Condé Nast publication, is similarly one of the trustees on the board of the New York Public Library. Irony in how we are asked to "share" a warning about social media companies? Whether it’s the internet or libraries, it all bundles up into the same thing. Some will think of it liberally as the free flow of knowledge. Others will think of it more restrictively as the information industry.- The “information wants to be free/information wants to be expensive” dialectic. One other thing about libraries- While Aaron Swartz had his mentors like Lawrence Lessig (working to curtail the corrosive effect of money in politics), Swartz was also an autodidact. He dropped out schools a number of times, both high school and college in preference for self-education. Certainly the internet can provide support for such self-directed campaigns, but traditional libraries have also long harbored and provided resources to those who are called to individualistically find their own way. . . But if the books are not in the libraries, or if the books that are there preferentially steer us in certain corporately decided upon directions then our needed successors to Aaron Swartz will be much fewer and further between. . . 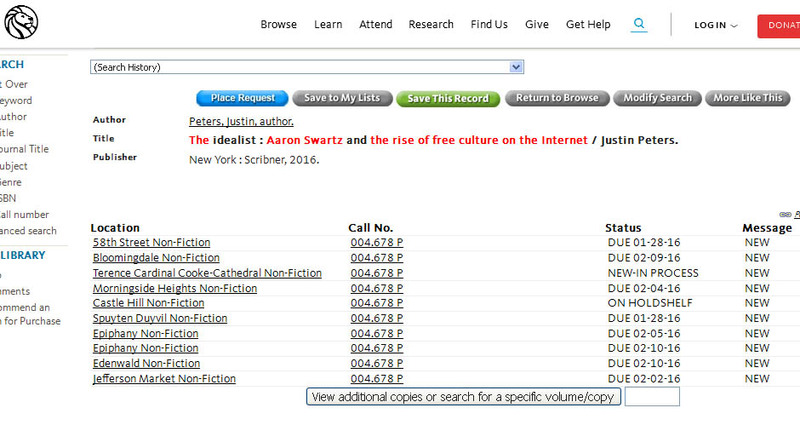 Some good news. . .
. . . As for that other new book just out, Justin Peters “The Idealist: Aaron Swartz and the Rise of Free Culture on the Internet.”- The BPL has thirteen copies, of which six copies are currently claimed by patrons and the NYPL has about 37 copies, of which 23 are claimed and 14 are available. But if any of the readers of this new Peters book are led by it to want to read the Chomsky book then they are going to have problems finding that book to retrace Aaron’s path through recent history.